Holding onto a regular mouse can put a lot of strain on your wrists after a long workday at your computer. Our hands and wrists weren’t built to sit at such an odd angle for so long, which is why so many people are developing Carpal Tunnel Syndrome. You need to take care of yourself lest you want to deal with costly surgeries. This usually means a change in equipment, but there’s no reason it can’t be awesome as all get out. If you want to lessen the harsh angle that your wrist is at, then a projection mouse similar to the projection keyboards we’ve looked at in the past would likely help you out. ODiN is the first of its kind, and though it is named after a Norse god, looks quite a bit like something out of Transformers. This is a small, portable device that will provide you with all the normal functions of a mouse and more. In addition to regular cursor movement, scrolling, and right and left click functions, there’s also dragging, forward, back, and zooming as well. It’s more gesture-based, which makes a lot of the movements more natural. 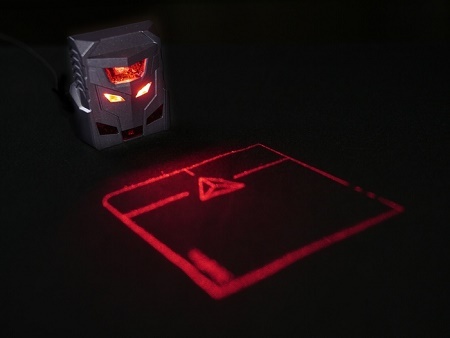 You’ll get a 8x8cm space to mouse around in from a 4x5cm box which can easily be tossed in your pocket or bag. There will be a USB cable to keep track of as it will need to be plugged in to work, but that won’t add much more weigh to your daily gear. This will cost you $49-56, and is currently a successful crowdfunding campaign.